Tyrannosaurus Mouse: Shouldn't I Have One of These? The answer is "Yes. Yes, Drew. I'll buy it for you." For $209 it looks to be a fairly cool control surface. The Behringer BCF2000 could be a drawbar controller for a virtual organ too (ahem.) 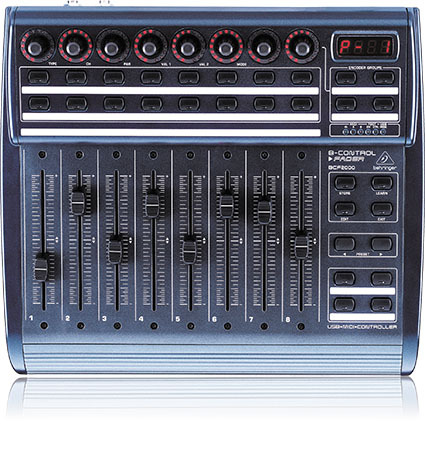 It has 8 motorized faders. There are minimal deck controls but honestly I would never use a jog/shuttle wheel anyway. It's not that I touch faders a whole lot or even that I have a fetish about touching them. It's just that this is a particularly inexpensive solution for those times when one might want a fader to control a DAW. I'm sorta curious about what a completely in-the-box live sound mixing system would be like. You'd have to really know what you were doing as a mixer in order to keep yourself out of trouble. But couldn't you set up a live system with all your favorite effects and everything? I think there's a way to do that. It would be some number of dozens of milliseconds out of real-time however. Which for live is not necessarily bad though, because you tend to time-delay your stacks anyway.